Ask for Help - it's free - a price we trust you can live with! Want to use a Kulula partner for your car rental from OR Tambo? Check out Europcar OR Tambo vehicle hire. Use the flight price comparison tool on the left to contrast Kulula flights from Cape Town to Johannesburg's OR Tambo International Airport, and make a booking. If you'd prefer to fly to Lanseria Airport, see our Kulula Cape Town to Lanseria flight pages. 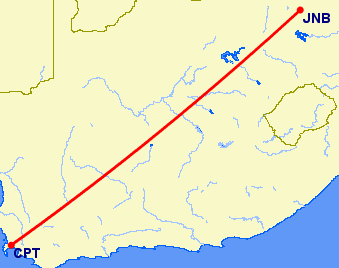 If you're flying in the opposite direction, see our Kulula OR Tambo to Cape Town page. Last updated on the 4th March 2014. There are 45 Kulula flights a week from Cape Town to OR Tambo. Thursday are the busiest, with 8 flights, and Saturdays the quietest with only 4 flights.